Il Diavolo / Accademia Arcadia. 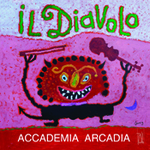 Jacqueline Ogeil from Accademia Arcadia said, "we named the CD in honour of Tartini's Sonata in G minor, nicknamed the "Devil's Trill" for its fiendishly difficult violin part and devilish reputation, superbly performed by our own Italian Devil, David Monti." She added; "It is said that Tartini himself dreamed that the devil appeared to him and asked to be his servant. Tartini handed the devil his violin to test his skill - the devil immediately began to play with such virtuosity that Tartini felt his breath taken away. Upon awakening Tartini immediately grasped his violin in to retain in part, at least, the impression of the musical dream. This work is paired with three superb violin sonatas by Antonio Vivaldi, Domenico Scarlatti & Arcangelo Corelli, works which perfectly encapsulate the spirit and elan of the 18th century Italy. Accademia Arcadia's interpretation of Corelli's La Folia will delight as will Davide's inspired improvisation on a theme by Woodend Winter Arts Festival's musical patron, Peter McGrath. An award-winning ensemble and the brainchild of esteemed harpsichordist Dr Jacqueline Ogeil, Accademia Arcadia is deeply honoured to be presenting this repertoire featuring improvising violinist Davide Monti, a regular performer in the world's top baroque ensembles. "I am thrilled that our Il Diavolo CD will be the premiere recording of this wondrous instrument." Jacqueline said.